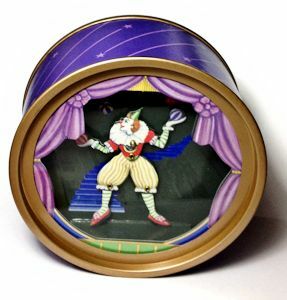 Designed by the award winning Artist Koji Murai, this Cute little Circus Clown dances to "Limelight" or "Send in the Clowns." You may select your preference when you add to cart. It is activated by an on/off switch located at the back of the shadow box. This box measures 4.75" in diameter and 2.25" deep. It is sure to please!